A number of problems can cause a rash to develop on top of your foot. It may eventually spread up to the leg and become more painful over time. That is why you need to identify the underlying cause and treat that rash in the best way possible. It is important to seek medical advice because some of these rashes can be quite contagious. So many things can cause a rash to develop on top of your foot. It could be the result of sunburn or a bite to the ankle or foot. Medical conditions may also be the reason why you have a rash on top of foot. Here are some common causes. Any exposure to certain allergens may trigger an immune reaction and cause a rash to appear on your foot or anywhere else on the body. Common allergens are plants like poison ivy, latex rubber and metallic substances such as chromates and nickel. To treat your condition, you need to avoid the allergen in the first place and take antihistamines to manage the reaction. Cold compresses and topical steroid medication may also help. This chronic condition starts in early childhood and may sometimes persist into adulthood. What causes eczema is not clear, but experts believe you develop this condition when your skin has little ability to protect itself from bacteria and environmental conditions. With eczema, you will develop dry patches of inflamed skin that will become very red and itchy. They may turn into small fluid-filled bumps. While there is no cure for this condition, you can try antihistamines, corticosteroid cream and UV light therapy to manage your symptoms better. Be sure to moisturize your skin regularly to prevent flare-ups. This fungal infection can cause itchy rash on top of foot. Generally, it starts as a rash between your toes – it starts as a ringworm rash. You are likely to develop this problem due to tight shoes, sweaty feet, and damp footwear. 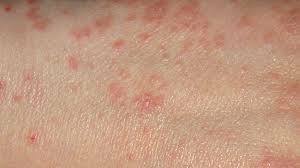 With this condition, you will develop itchy, scaly, red foot rash that will also cause a burning or stinging sensation. Blisters can also develop in some cases. The use of antifungal medication may help treat the problem, but you also need to take good hygiene measures to keep things under control. Keep in mind that athlete's foot is contagious, so you should practice care and not spread it to others by sharing contaminated towels and clothing. This chronic skin condition can also cause itchy rash on top of foot. There will be dry itchy patches on your skin, usually caused by rapid overproduction of skin cells. Those lesions can be very small and localized but they can sometimes turn into major eruptions and affect your whole body. For mild to moderate psoriasis, you can use ointments and creams. For severe lesions, you may have to take oral medications along with creams. Topical psoriasis treatments usually include vitamin D analogues, topical corticosteroids, calcineurin inhibitors, anthralin topical retinoids, moisturizers, and salicylic acid. Phototherapy may also help in certain cases and involves exposing the affected skin to controlled amounts of sunlight. Your doctor may also use other forms of light therapy, including artificial UVA or UVB light. If your psoriasis does not respond positively to these treatments, your doctor may consider injected drugs into your body to help control your symptoms. Caused by a parasite burrowing under your skin, this contagious skin condition can cause an itchy rash on top of foot. The itching usually becomes worse at night. When you have this condition, you may notice small, red spots in the webs of toes and fingers. You can use permethrin cream to treat scabies. This insecticide helps kill the mites. You can also use malathion liquid, a lotion that proves effective when you cannot use permethrin. Both these products are easily available in the market – you can get them on prescription. You have to apply them to your skin and repeat the same after a week. This is to ensure that no mites have survived from the first application. Keep in mind that hot baths and severe scrubbing with water and soap will not help with a scabies infestation – only an insecticide can produce positive results. Also called neurodermatitis, it is a type of anxiety disorder and causes your skin to feel irritated. With this condition, it is very easy to develop an itchy rash after slight irritation. You may end up damaging your skin due to intense itching. You will have to use high potency topical steroids to treat this condition. Your doctor will make you use those steroids under occlusion for 2-3 days to produce positive effects. You also need to make a conscious effort to stop scratching or else you will end up exacerbating the condition. Your doctor may also recommend the use of antihistamines to reduce pruritus. Also, keep your skin moisturized and avoid stress and anxiety to improve your condition. Be sure to talk to your doctor if you are feeling concerned about your foot rash. He/she will check your condition and ask certain questions to determine the cause. Keep in mind that early diagnosis is always going to help treat the problem and keep you from dealing with widespread rash.